As many of you know, my family and I are expecting baby number three in just a few short weeks. As I take some time off from work and blogging to spend time with my family both before and after my new son’s birth, I am thrilled to share with you some amazing posts written by some very talented bloggers. So please sit back, relax and enjoy this guest post and leave a comment letting us know what you think! Today we have Kristina from Toddler Approved (one of my favorite bogs!) sharing some fun science activities that promote language and communication. ENJOY! Science is seriously awesome. 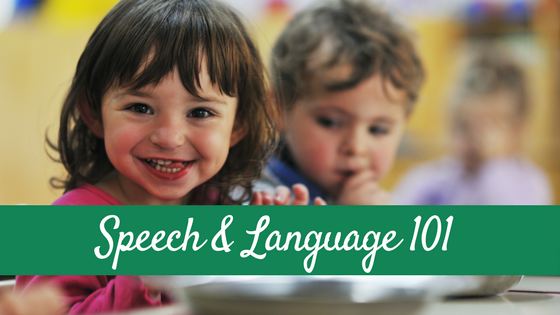 It is sensory, social, and chock full of language building opportunities! 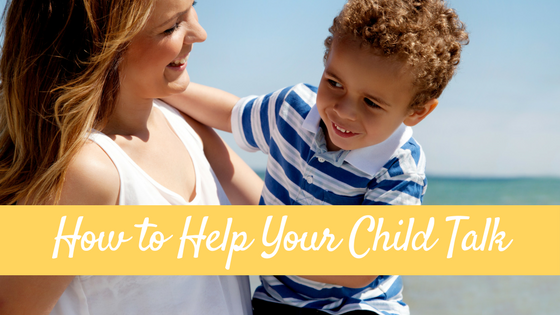 As a stay-at-home mom and former teacher, I love to look for teachable moments as we play and explore each day. Science is a huge part of our daily lives. As parents and educators we can infuse science activities into each day in simple ways than can make a big difference. 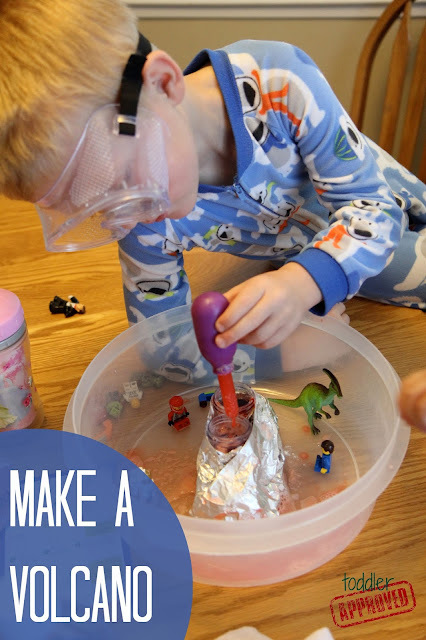 You can make volcanoes out of all sorts of materials- aluminum foil and plastic tubes, play-doh, clay, sand, and even just plain water bottles. The key ingredients you need to have are baking soda and vinegar. Food coloring is awesome to use too. Just build a volcano-like structure, add baking soda into it, and then drop vinegar in and watch the reaction.Make predictions ahead of time about what you think is going to happen when you combine the baking soda and vinegar. Add drops of food coloring to your vinegar and have kids guess what color will explode out of their volcano.It is hard to get kids to stop talking when you are doing this activity long enough to give any instructions because they get SO EXCITED! As we interact with the different materials we also use our five senses- especially our sense of smell, touch, and sight. It is neat to have the kids touch each material and describe what it feels like. 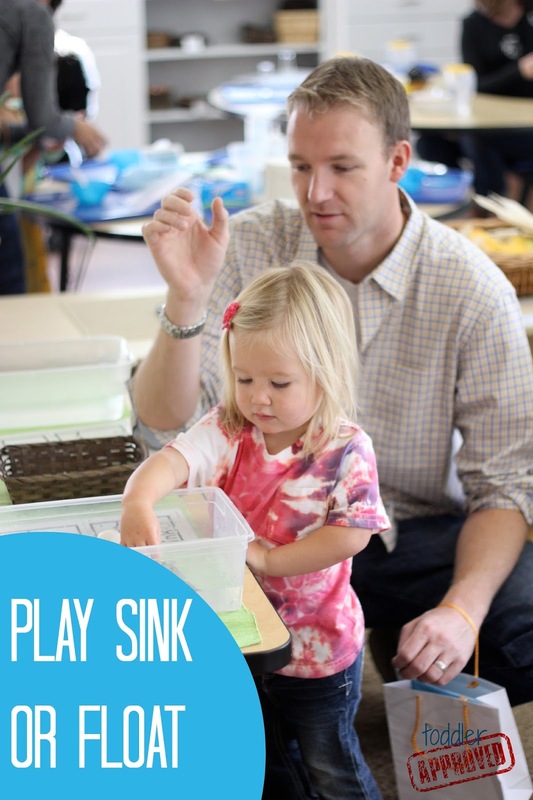 Sink or float is a favorite water table or bathtub activity at our house. You can start out with a hunt around the house to find a variety of objects to experiment with and then take them to the water. Hunting activities provide loads of opportunities for learning names of objects around your house and talking about directional words like over, under, up down, on top of, etc.Hunting never gets boring with my 5 year old and 2 year old. We love making predictions about which objects will sink and which objects will float. Once we drop them all in the water it is neat to observe what happens. Often my toddler will be so surprised by the results! I was introduced to the idea of experimenting with frozen vinegar by Trisha at Inspiration Laboratories. 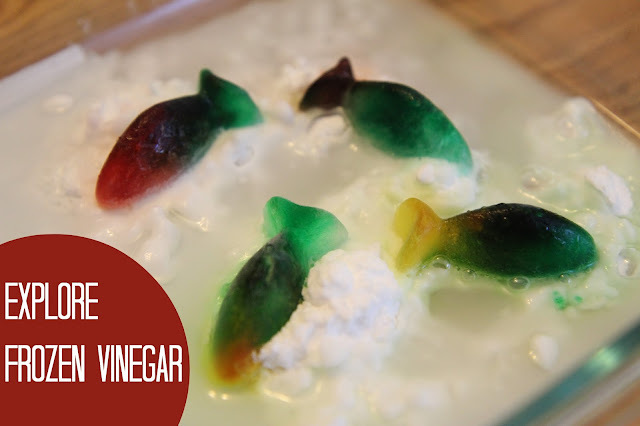 Earlier this summer we read The Rainbow Fish by Marcus Pfister and we made some frozen vinegar fish using some fish ice cube molds. After the fish were partially frozen we dropped food coloring on them to create our very own rainbow fish. Then we returned the fish to the freezer. Once the rainbow fish were completely frozen, we dropped them into a 9×9 pan of baking soda (with a tiny bit of water). Before we dropped them into their “baking soda ocean” we made predictions about what would happen to the fish and their colors. Then we watched the colorful vinegar and baking soda fish reactions and the kids loved describing what they saw happening. We did the activity again and again and again. Each time the results were a little different and offered some new observations. We also love children’s literature and enjoy finding ways to make connections with books while exploring and having fun. When I tie a book to a multi-sensory activities it is amazing how much more information my kids are able to retain. 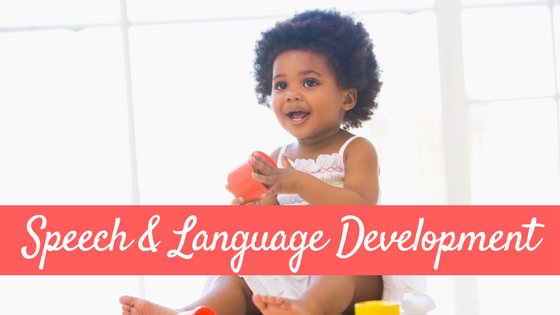 Language that is taught though a hands-on experiences gives kids a place to build from as they learn more abstract concepts. Science activities are also great because they typically require working together and social interactions. 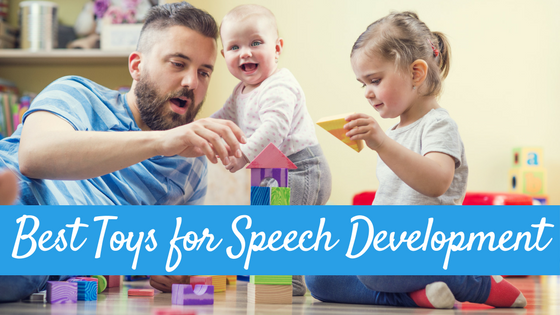 Kids can practice making simple requests and following directions from their peers, siblings, teachers, or parents. If directions aren’t followed or you don’t work well together, often the experiment fails. 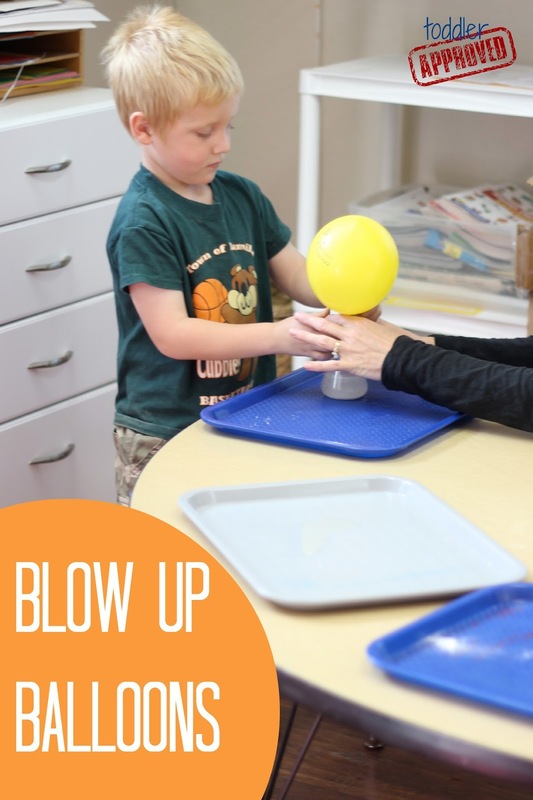 This baking soda and vinegar balloon experiment is one that is super cool because the reaction is so visual and dramatic. Young kids need to work together with an adult or older sibling in order to be successful with this experiment. Since this activity requires some more advanced fine motor skills, it is a great one to use when you want to work on teaching kids to ask for help or make specific requests. 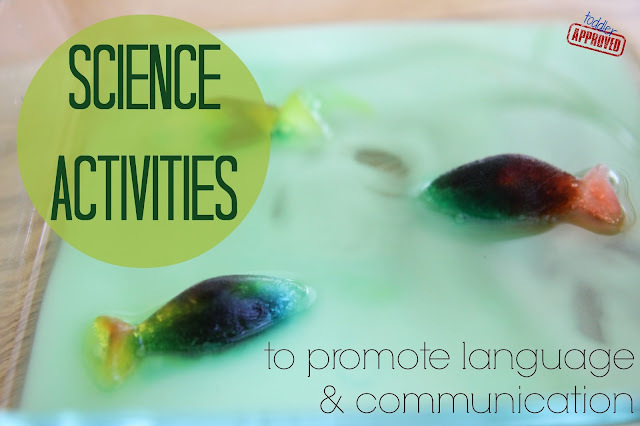 Have you used science activities to promote language & communication in your homes or classrooms? What are your favorites? 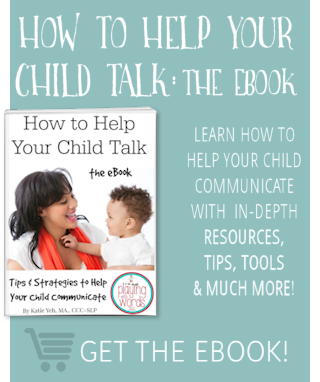 Kristina is the author of Toddler Approved, a blog where she helps parents capitalize on teachable moments in everyday life and motivates them to discover, create, and learn with their children. She is a mom of three and is a former Special Education teacher. When she’s not blogging, you’ll find Kristina jogging around town, organizing church and neighborhood social events, throwing crafting parties for kids, and traveling with her family. She also hosts a monthly Virtual Book Club for Kids online and a Mommy & Me Book Club with friends offline. Kristina tweets as @ToddlerApproved and can be found on Facebook and Pinterest. 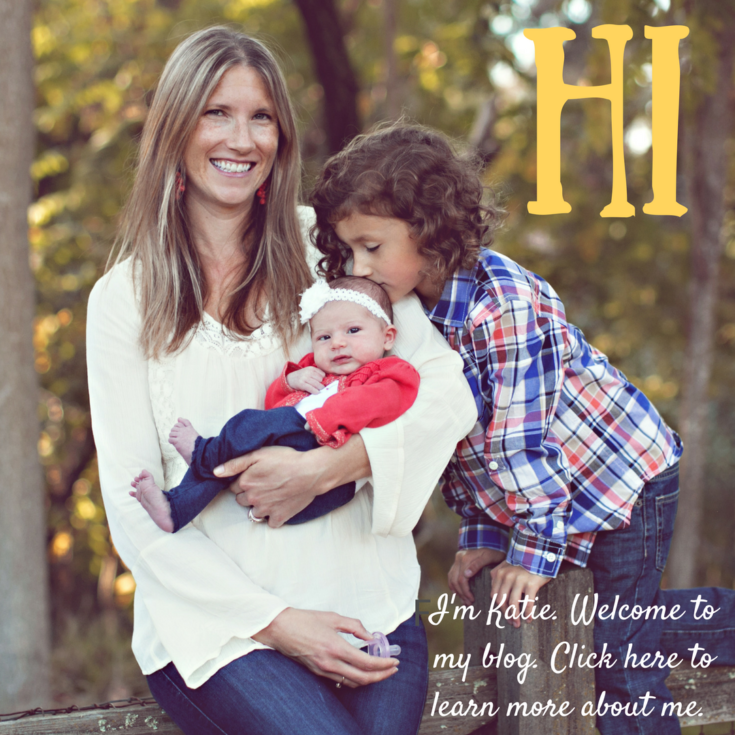 Thanks Katie for letting me guest post! Can’t wait to see your cute little guy soon! Congrats again! Awesome!! Can’t wait to see!